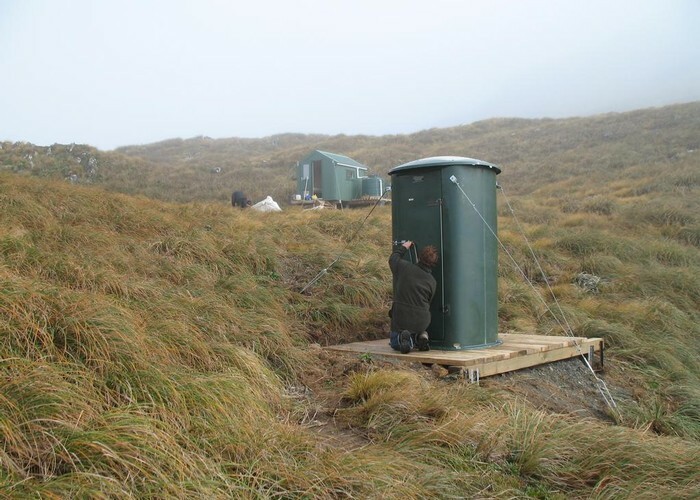 This is not the usual Northern Crossing from Levin to The Pines via Mitre Flats Hut. Rather it exits via Baldy, Atiwhakatu Hut and the Holdsworth road end. The last day would be very long and should be broken at Atiwhakatu Hut. North Ohau Hut • By davo32. Waiopehu Hut • By mantis. Licence: C.
A taxi from Levin will normally drop you at the narrow "pipe bridge" on Gladstone Road across the Ohau River - a couple of drivers will take you all the way to the road end. The road end is only 10 minutes walking up the farm access road and has a triangular patch of grass with a couple of picnic tables, a toilet and an intentions book (under the cover on the park sign). Don't go through the gates past the farmhouse, but cross the stile just inside the gates. The path leads a few metres to a farm track going gently downhill and across a paddock to another stile (electric fence so take care). The farmer usually runs cattle in the paddocks along the route - look out for the obvious by-product. Over the stile, the path rises slightly to pass a rock outcrop with a plaque on it about the Levin Waiopehu Tramping Club. A small stream is crossed and then a river terrace takes you to another electric fence (just a strand of wire) with a squeeze to one side. A last stile is crossed to enter the bush edge about 10 minutes from the road end. Just inside the bush there is a junction of tracks with signs up on the trees. The track climbing up the slopes to the right goes to Waiopehu Hut which is a good (drier) alternative route to Te Matawai if the river is high. The track to the Ohau Shelter goes straight ahead. It takes about an hour to get to the Blackwater Stream (with a high swing bridge) and another 5 minutes to the Ohau Shelter (the partially dismantled remains of a hut). The walking is quite level along a good track with a few glimpses of the river below - the crossing of an old slip about halfway gives a good view. There is a grassy patch next to the shelter that provides a nice spot for a break. The track continues past the hut (slightly muddy but plenty of stepping stones) and down to the river. On the way you pass Ozzies Track which provides another access route to the junction of the North and South Ohau Rivers. While it starts off as a good track, it soon becomes a narrow sidle along the contours with a nasty rock outcrop to navigate at the end. It takes the about the same time as following the river. The main track joins the river at a large gravel bank. It is wise to note the entry point in case you return back down the river. Arete Hut and Norski toilet • By OldGoat. Licence: C.
The walk up the river to the junction is mostly on bouldery banks with a number of crossings. At the end of a dry summer, I found all of the crossings easy (my knees remained quite dry). A couple of the crossings have swift water even in moderate flow and you should expect them to be around knee deep. The usual time to the junction is 40 minutes with a further 80 minutes up from the junction to the first hut. Ozzies Track emerges about 25 metres downstream. From the junction, a nice little gorge is quickly passed though to more open terrain - look out for a cute mountain cataract on your right. Half an hour of easy river travelling will take you into the upper gorge - much narrower than the lower one and more interesting. The river bed is rougher to travel with one diversion up the bank for a few minutes to avoid a deep pool. One pool that you cannot avoid is situated near the middle of the gorge - there are vertical walls on either side. Normally this is a swim in chest-high, chilly water for a few metres onto a rock ledge followed by a scramble over rocks to bypass a small waterfall. The rest of the gorge features a couple of thigh-deep crossings before its end. After the narrow confines of the gorge, there is a real feeling of space for the rest of the walk to Butcher Creek. There are even a couple of river flats suitable for camping on the way. You know that the creek is near when you see a "Road Works Ahead" sign on an outcrop of rock in the middle of the river. Note that the Yeates Track is accessed from about 20 metres up Butcher Creek (on your right) rather than straight from the river. The initial section of the Yeates Track is commonly known as the Yeates 600 for the steep 600 feet (182 metres) climbed. It tries to zigzag up the slope but there are still a couple of big steps to haul yourself up. Forty minutes brings an abruptly level patch marking the easing of the slope. Another 40 minutes of gentler climbing over various bumps brings the well-marked junction with the track from the Butcher Saddle. 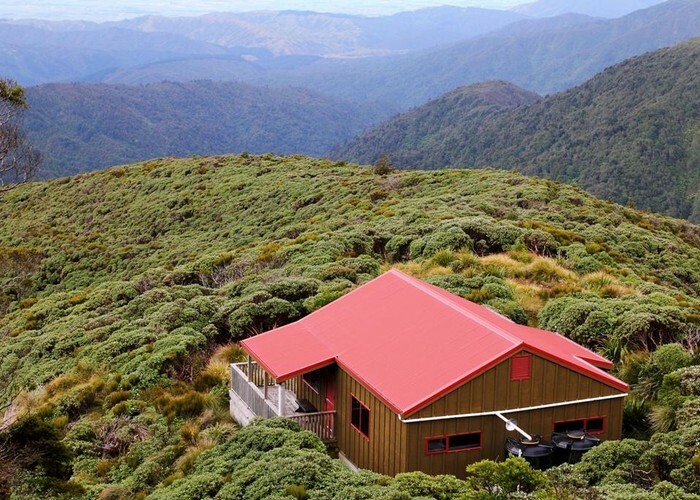 Te Matawai Hut (sleeps 30) is 35 minutes from the junction - the track firstly dips down a bit and then climbs steadily. Keep an eye out for a metal tag on a tree on the right about halfway up - this marks a route down to the headwaters of the Otaki River (an interesting alternative if conditions do not permit travel on the tops). Normally allow about 2 hours between huts. Dorset Ridge Hut • By madpom. Licence: cc by. 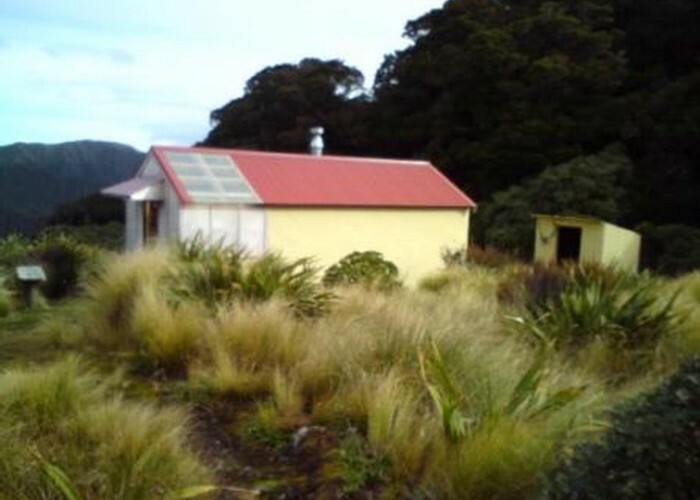 The hut is big and roomy with a clear view of the ridge leading up to Pukematawai (which hides Arete from the hut). Triangle Knob and Mt Dundas can be seen beyond the ridge. The panorama is even better from the rise above the helicopter pad a few minutes back along the track. From Pukematawai, the Main Range makes its undulating way to the south. The first prominent bump along the range is Butcher Knob with the sharp peak of Lancaster just showing behind it. A long spur rising from the Otaki River valley points to the bald top of Kelleher. 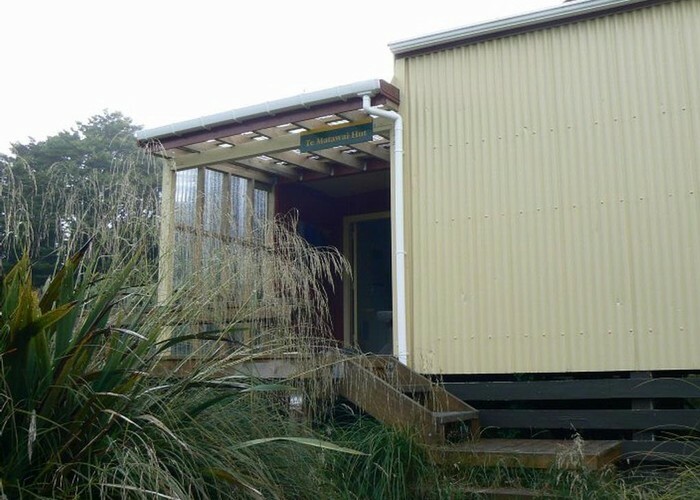 The track starts immediately outside the hut's front door and goes past the toilet into a dip, passing the old hut site. There is plenty of mud to endure while crossing the dip but the track becomes drier as it climbs up a small knob. At the top of the knob (15 minutes from the hut), there is the obvious turn-off down to the Girdlestone Saddle. The rest of the ridge is steady climbing with a few tiny steep bits and a fairly overgrown track until higher up. On a fine day, the hut is visible all the way to Pukematawai giving a good indication of progress. The main range is joined just a couple of minutes from the top - there is an unobtrusive junction with the route south along the tops. If you find yourself coming down from Pukematawai, note that the main range ridge continues straight ahead while the ridge to Te Matawai Hut drops to the NW. On a clear day, the views from here and Arete are tremendous. The summit of Arete is an easy 20 minutes away over a small saddle (135 minutes from the hut). With good visibility, you can head directly to the Northern Crossing route from the summit but don't even think about it in cloud unless you want to experience the hanging valley and waterfalls on the south face of Arete. The better route is to head east along the ridge towards Dundas and Bannister for 6 minutes where a tiny rocky notch crosses the ridge. There is the first of an intermittent series of iron poles in the notch. Turn south across the slopes and drop to the Arete Tarn and Bench, along a stony gully for part of the way. The tarn is a reliable source of water and a good excuse for lunch. An option is to visit the Arete Biv by dropping east from the tarn to a gully and following this for 150 metres north to the biv. Fresh water can be found at a spring about 75 metres down the watercourse to the north of the biv. 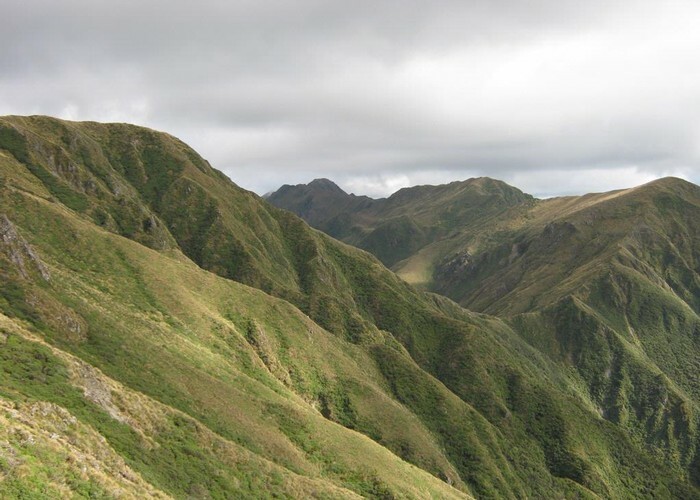 Saddle between East Peak and West Peak Northern Tararua • By Gaiters. Licence: C.
The Northern Crossing route is regained by heading south from the tarn. A gentle climb up to point 1385 is followed by a short ridge walk to a climbing sidle along the ridge to Lancaster (60 minutes from Arete, 1504m high). At the highest point of the sidle is a mandatory diversion in clear weather. Drop your packs and head along the nicely sharp ridge up to Lancaster for the best viewpoint in the park (10 minutes to the top). The view to the north is Pukematawai and Arete of course with the sharp ridges of Bannister over the ridge to the NE. To the west, you can peek over the main range and glimpse the speck that is Te Matawai Hut. At your feet to the south are the headwaters of the Waiohine River and to the north there is the Park River valley - the wide U-shaped valley is thought by many to be the only glacial valley in the park. The lightly padded track over Lancaster leads along the Carkeek Ridge via a hut to Park Forks where the Park River joins the Waiohine River (the longest in the park). Beyond the forks looms Mt Crawford (1462m) and the rest of the main range. The rest of the day's route to and over Tarn Ridge lies to the east (the new hut is actually over a couple of bumps from the south end of the level Tarn Ridge) with the Waiohine Pinnacles looking suitably rugged. Further south, Girdlestone marks the point where the ridge splits to go to Mitre (east) and Holdsworth (west). Over Tarn Ridge, another level ridge (Table Ridge) extends north from Brocket (near Mitre) to drop to the Waingawa River at Cow Creek Hut. Having fed your eyes and soul, return to your packs and travel a few minutes south to an iron standard at the head of the Waiohine Pinnacles. This marks a useful escape route down to Arete Forks. There are only a couple of pinnacles to cross with a number of sharp bumps beyond them. The well-defined route over the pinnacles needs care only in snow or wind. The second pinnacle is geologically interesting since it is an intrusion of red volcanic rock in the usual grey rocks of the ridge. The level start to Tarn Ridge is quickly reached. 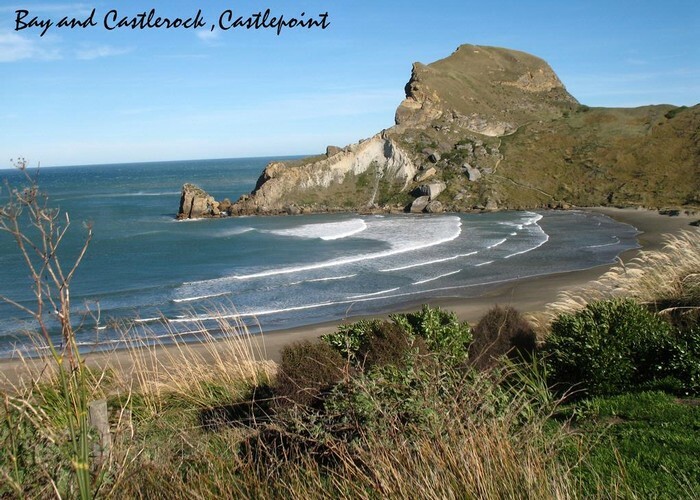 Castle Rock ,Castlepoint,Wairarapa • By OldGoat. Licence: C.
After the level walking, the trail dips SE and climbs over a small bump and a saddle to a knob and Blatchfords Cross - a wooden cross commemorating a deer hunter who died in the ranges and is buried alongside the track. 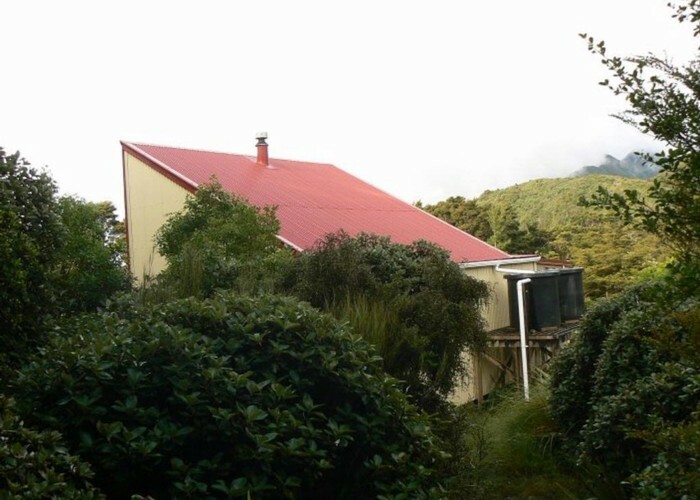 Tarn Ridge Hut (sleeps 16) is in a small basin to the east of the ridge between the cross and point 1371 - there is a signpost on the track pointing the 30 metres down to the hut. The day starts with a steady climb up the ridge from the hut to the junction with Dorset Ridge (joining from the SW) - 20 minutes from the hut. There is a large scenic tarn on the south side of Dorset Ridge. In another 10 minutes, the Girdlestone Pinnacle is reached as the ridge tends to the east (a bit of a scramble up but no great difficulty). The pinnacle can be sidled to the north in winter. Within an hour from the hut, you reach the large survey beacon on the top of Girdlestone at a height of 1547 metres. This is another spot with great views, especially north to Bannister. The twin peaks of Mitre (at 1571 metres, it is the highest point in the park) and Peggy's Peak (1545m) are prominent to the east. From Girdlestone, Mitre is about 60 minutes away to the east with the descent to Mitre Flats Hut (sleeps 20) taking another 2 hours. This is the usual exit route (another 3 hours to the road end). The exit via the Holdsworth road end starts by backtracking 30 metres to the junction with the ridge to Adkin. The southwards descent is along a rocky and sharp ridge with the valley of the South Mitre Stream opening up on the east. On the way down, you should pause to look into the valley and admire the 20 metres of waterfalls in the upper basin - to be avoided by a sidle to the scree gully draining Mitre if you have to escape down the stream (quite rough going with a couple more waterfalls lower down). In the saddle before Adkin, there are a couple of reliable tarns encouraging a morning break. Te Matawai Hut • By Haqii. Beyond the saddle, the track crosses over a small bump (starting to the west of the tarns) and then climbs up to Adkin (1460m, an hour from Girdlestone). There is a bit of a climb up to North King (1535m) but no problems following the track. Middle King (1521m) is really just a knob in the level ridge between the other 2 Kings but has a nice little (and shallow) tarn right next to the track. South King (1531m, iron tube on the top) is not impressive but provides a point to evaluate the track as it goes on over the Broken Axe Pinnacles to McGregor. The route can be extended to Jumbo Hut (3-4 hours away) in fine weather. The turn-off to Baldy is a few minutes down from South King and is marked by a cairn on a small knob. The track starts off a bit indistinctly but soon defines itself for a rapid descent along a tussock spur (about 200m dropped to the saddle before Baldy). Baldy's flat eroded summit (1325m) is reached by a gentle climb from the saddle. The tussocky hummocks around the sandy top give good seats for a bit of a rest. Head east from the north side of the tussock surrounding the summit for a few metres until you join the spur descending NE from Baldy. There is a cairn marking the Barton Track (to Mitre Flats) turn-off less than 10 minutes down the spur where it turns more to the south. It is easy to follow with plenty of cairns, especially at the bush edge (20 minutes from Baldy). In the bush, the track is not well padded but is adequately marked for the hour or so down to Atiwhakatu Saddle. The stream is 10 minutes down from the saddle down a track that is steeper than it looks on the map. The Atiwhakatu Stream is crossed by a good swingbridge. The track down to the Atiwhakatu Hut (sleeps 10) takes about an hour and is in fairly good condition except for a couple of slips. The first is easily crossed with a climb up and along its face and then down a rocky gully to the stream. The second slip is a much harder proposition with a scramble down a clay bank, squeeze under a fallen tree and then slippery soil to cross. A wetter option is to backtrack a little and break out of the bush to the stream. A few crossings of the stream take you through a flood channel on the true left and back to the track by crossing to a gravel bank on the true right and clambering onto a flat which the path crosses. The only other problem you may find is that the track is a bit indistinct where it meets the northerly track down from Jumbo - it looks like it goes into a marshy river flat (with the junction signpost on a bank) however the bank is better gained by an overgrown fork just before the flats. The rest of the track to the Holdsworth road end is wide (except where it crosses one small slip), mostly gravelled and level. All the major side-streams are bridged - one with a tree. There are nice views back up the valley from the sparsely treed sections above the minor gorge before Donnelly Flat. ianfisk The South Ohau Hut hut was demolished due to subsidence caused by a large slip. Thus you will have to walk a couple of hours further uphill to Te Matawai Hut. blobbles Awesome views if you have clear weather! Not a tramp to be done by the inexperienced/those that can't navigate by compass, as if the wether closes in thats all you have to go by. Thank god someone put a sign on top of the ridge next to Tarn ridge hut! The pinnacles are an interesting section that I would not recommend in windy conditions. morepork This is a great trip and the article gives a pretty good description of the route. I was surprised to see that you have it rated as easy to moderate when the Southern Crossing is rated moderate. I would consider this harder than the Southern Crossing especially in terms of route finding for less experienced trampers, the area around Arete can be particularly confusing if visibility is poor. 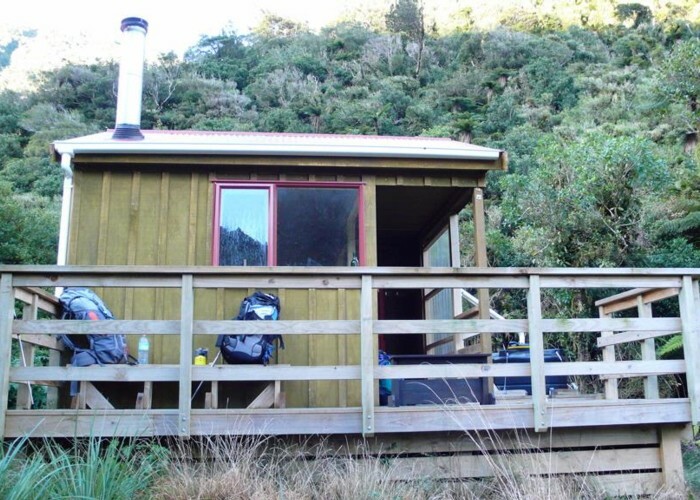 tararua This is an excellent trip all year round.Summer is better but experienced partys need good equipment during a winter crossing.There is no accommodation now on day one until Te Matawai Hut is reached.South Ohau Hut is to be removed this month due to a slip beside the hut. Added 1 January 1999 by ianfiskianfisk. 4 revisions, most recently 9 January 2006 by MatthewMatthew. 547 views in the past year (46 per month).